Stud, Cluster, Drop, Hoop or Designer. With so many different styles of Earring available, how do you know which is best for your style? Deciding on Diamond Earrings to suit your style can be a tough choice, so we've come up with a small purchasing guide which will help you decide on the perfect earrings, according to your taste and style. 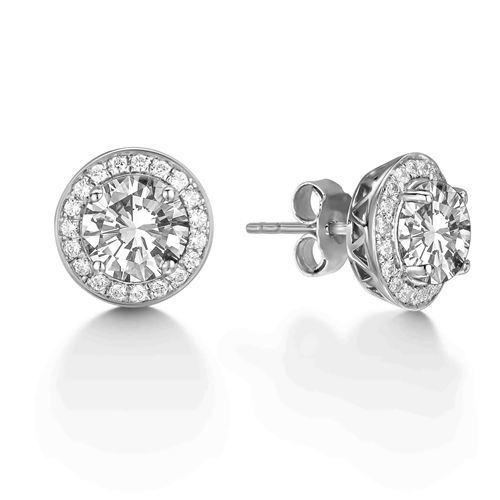 Classic Diamond Studs are by far the most popular style of earring there is to offer and we can understand why. Not only does this style ooze class and style, but it also offers comfort and convenience. We recommend the Love Knot Round Diamond Stud Earrings as your go to stud. Not only will they compliment your facial features, they are also a great addition to a glamorous evening out with friends or even that perfect date night. One of the most in demand earring styles we have at the moment is the simply magnificent Four Claw Diamond Stud. This timeless style is not only the perfect showstopping piece, thanks to the stunning solitaire diamond, but it is also suitable for any event day or night. The Halo Cluster Earring is making it's comeback amongst our customers, as the vintage chic style is a fashion must and the Halo style simply oozes this. One of the benefits of Halo jewellery is that the central stone is made to look larger, thanks to the outer halo. This has led to a huge demand not only in Halo Earrings, but also Halo Engagement Rings, as more and more brides want a truly stunning engagement ring and also the earrings to match. As one of the most up and coming earring trends, the Halo Cluster Earring style would be the perfect addition to any outfit. For that extra special look, why not try teaming the outer halo of diamonds with a gemstone central stone? Contemporary and chic are two words which perfectly summarise the truly breathtaking Diamond Hoop and Drop Earrings. Perfect for that romantic anniversary or a beautiful family wedding, these particular styles are the way to add a touch of class and sophistication to any look. If you are after the drop style earring, then our truly elegant Graduated Teardrop Round Diamond Earring would be the perfect choice for you. It combines the ideal hoop design with a magnificent rounded diamond cut, perfect for any occasion. 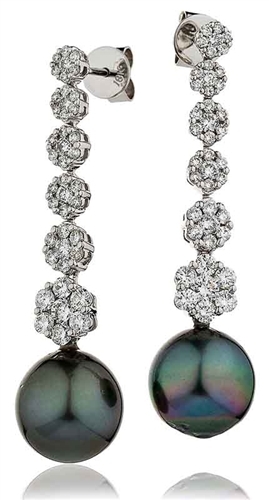 If you are looking for something which is a slightly more traditional drop earring then our beautiful Round Diamond & Black Pearl Drop Earrings are the perfect choice for you: not only do they have a complimentary drop design, but the inclusion of black pearls will add a touch of sophistication to any outfit. 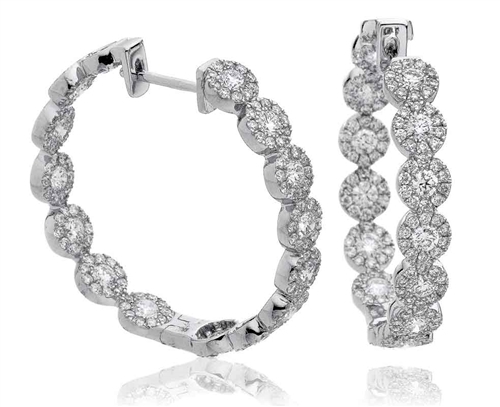 Alternatively, if your heart is set on a classic Hoop Diamond Earring, then we recommend our simply stunning Elegant Round Diamond Hoop Earrings. Not only will they compliment the structure of your face, but they also make for a beautiful and standout piece that can be worn day or night. If you are one who wants to stand out from the crowd and are after something truly unique and different thenDesigner Earrings are the ideal choice for you. Unique and striking, Diamond Designer Earrings are not only perfect for those very special occasions, they also makes for a beautiful gift for a loved one. We recommend our Round Diamond Drop Earrings, as the ultimate statement piece. These designer earrings can be personalised and crafted to suit your particular taste and are guaranteed to turn heads. We hope this post has helped you decide on which earrings you should buy to compliment your style and taste. If you have decided on a particular design that is truly perfect for you then please take a look at our fantastic selection of Diamond Earrings we have available. If you still need a little inspiration, then feel free to get in touch with us today for a free consultation. 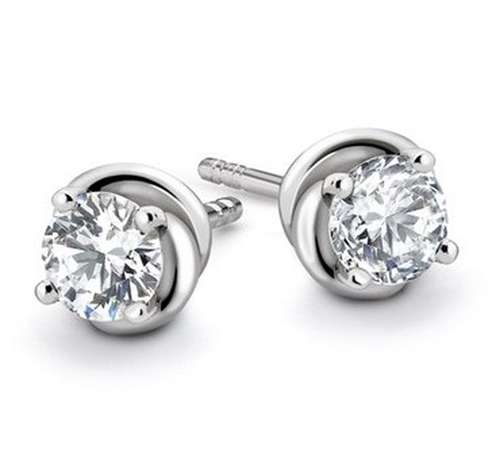 Alternatively, you can visit our Diamond Earrings Christmas Gift Guide.